My colleague Rebecca has been having a highly unwelcome episode of dental trouble that necessitates a strict soft food diet. Tired of the usual choices, she asked her boyfriend, Daniel Atjai (a professional chef) for some sushi. 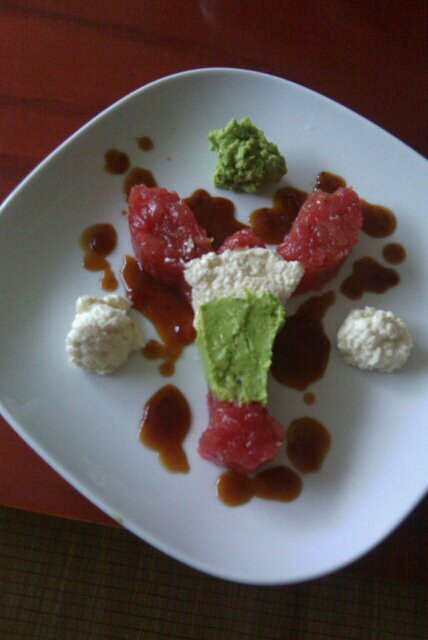 Here’s what he came up with: fresh tuna, seasoned soft tofu, and mashed avocado – a nice nutritious meal – arranged to look like a lobster and anointed with soy sauce. Now that was art with a heart!